Mind the gap: epiblast geometry at its extraembryonic boundary constrains BMP localization and ensures robust gradient formation. The early mouse embryo is patterned by a rich landscape of overlapping gradients of signalling activities, which allow cells to leverage the type, the timing and the strength of these signals as a read-out of position, thus ensuring correct allocation of fates. In mouse (as in human), an important contribution to these signalling cues and to their organisation comes not from the embryo, but from extraembryonic tissues. Bone Morphogenic Protein 4 (BMP4), secreted by the Extraembryonic Ectoderm (ExE, cfr. Figure A), is one of such cues. Accordingly, in the E6.0 mouse embryo a sharp band of BMP expression marks the entire boundary where the ExE meets the embryonic epiblast (EPI). EPI cells detect these molecules through the BMP Receptor 1a (BMPR1a, also known as Alk3). Consequently, the detection of BMP4 provides a read-out of relative position, and specifically of closeness to the ExE to the otherwise equivalent cells of the early EPI. Active BMP signalling restricted to the proximal boundary of the EPI contributes to important developmental events such as Primordial Germ Cell specification, and extraembryonic and posterior mesoderm development. While the textbook picture described above makes intuitively sense (patterning of the proximal EPI by proximally-restricted BMP activity, in turn explained by a proximally-located extraembryonic source), it clashes with the – often overlooked – geometrical reality of the mouse embryo. Indeed, how can the signalling activity of BMP4 molecules be restricted to the proximal EPI given that BMPs are likely secreted into the amniotic cavity, spanning the entire length of the embryo? The preprint highlights the importance of restricted receptor localization, and consequently the embryo’s geometry, in the establishment of a robust signalling gradient of a morphogen. Using complementary in silico, in vitro, and in vivo approaches, the authors investigate the extracellular dynamics of BMP through the interstitial fluid, from its source to its destination. 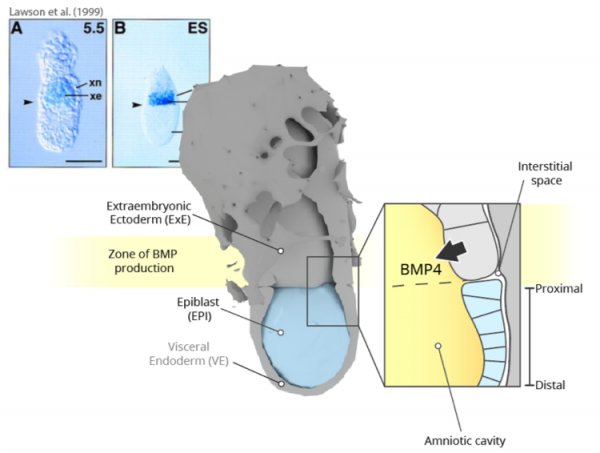 Simulations show that regardless of where BMP molecules are exactly secreted within the embryo, they accumulate within the amniotic cavity: BMP molecules have access to the entire length of the embryo as they are produced. Crucially, indiscriminate signalling activity across the entire EPI is prevented by the compartmentalisation of BMP receptors to the opposite (basolateral) side, making cells unresponsive to apically-presented ligands. A very restricted subset of EPI cells (those at the ExE-EPI boundary) does however respond to BMP in vivo. How does this happen? A major premise of the study is the identification of a channel, at this very boundary and at the embryo’s presumptive posterior, allowing communication between the amniotic cavity and the interstitial fluid on the opposite side. By diffusing across this only gap, BMP can infiltrate the basolateral interstitial space and bind to EPI receptors. Simulations show that this configuration is sufficient to establish a signalling gradient from the edge of the EPI inwards: as molecules enter the confined space of the basolateral interstitium, they will bind the closest available receptor, with lower and lower chances of reaching more distal cells (cfr. Figure B). Predictions of the model were tested in hESC monolayers (as these too have basolaterally-localized BMP receptors), with consistent validation in the mouse embryo. Pharmacological disruption of tight junctions between responding cells broadened the domain of induced downstream signalling, and mislocalization of BMP receptors on the apical side resulted in ectopic BMP activity. The importance of geometry was also highlighted in experiments using embryos without ExE and/or visceral endoderm (VE in Figure A), bathed in BMP. Taking into account both receptor localization and geometry, the preprint identifies the distance from the edge of the EPI – rather than from the signalling source – as the major determinant of EPI patterning in the mouse embryo. It also highlights the amniotic cavity as a buffer of morphogen levels, ensuring robustness of patterning across variable developmental conditions. The authors underscore a crucial yet under-appreciated point of developmental patterning: given that signalling receptors are not homogeneously distributed along cellular membranes (at least for BMP signalling), their orientation relative to different embryonic compartments becomes critical to their ability to respond to surrounding cues. What matters now is not anymore the proximity of signalling sources, but the accessibility to the signals. Another significant observation is the identification of reservoirs of signalling determinants (here the amniotic cavity), acting as buffers of signalling fluctuations during embryonic development. More broadly, the paper joins an increasing body of literature highlighting mechanics and geometry – and not just biochemistry – as instructive cues of development. From an experimental point of view, we want to highlight the incredible ability of the authors to achieve control over receptor localisation. Indeed, such a strategy could be leveraged in other systems where density-dependent differential ligand accessibility to receptors has been demonstrated to underlie differentiation and fate positioning [cfr. micropatterned colonies, Etoc et al, 2016]. We also appreciate the new data about in vivo BMPR1a localisation, as well as the use of microfluidics to discriminate between alternative coordinate systems (distance from source versus distance from edge) and to correlate this to cell fate. Recently, a preprint by Recho, Hallou, and Hannezo described how a gradient of a single morphogen could generate advective interstitial fluid flow, refining the gradient profile and eliciting a concentration-sensitive mechano-chemical tissue response (Recho et al, 2018). It would be interesting to investigate if this is the case for BMP signalling in the pre-gastrulation mouse embryo. Is the channel between the amniotic cavity and the interstitial space, marking the ExE-EPI boundary, only at the proximal presumptive posterior side? Is there a similar channel at the presumptive anterior side? How does the model fit with the fact that later during gastrulation the interstitial space becomes invaded by mesodermal cells? Is the gradient maintained? Is BMPR1A also graded from the edge of EPI inwards? 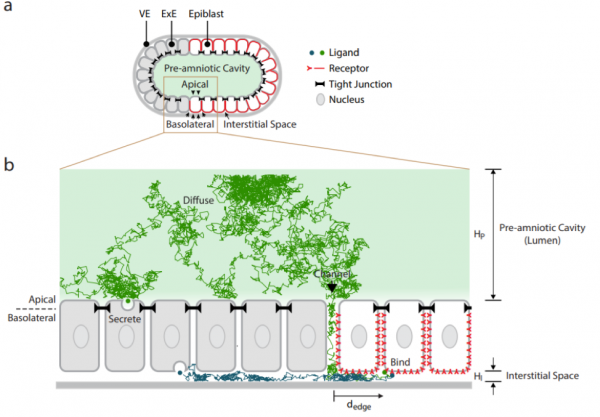 What would happen if receptors were selectively removed from the first section of cells on the edge? Do you expect a distal shift of the signalling gradient? Stower, Matthew J., and Shankar Srinivas. “The Head’s Tale: Anterior-Posterior Axis Formation in the Mouse Embryo.” Current topics in developmental biology. Vol. 128. Academic Press, 2018. 365-390. https://doi.org/10.1016/bs.ctdb.2017.11.003. Lawson, Kirstie A., et al. “Bmp4 is required for the generation of primordial germ cells in the mouse embryo.” Genes & development 13.4 (1999): 424-436. https://doi.org/10.1101/gad.13.4.424. Winnier, Glenn, et al. “Bone morphogenetic protein-4 is required for mesoderm formation and patterning in the mouse.” Genes & development 9.17 (1995): 2105-2116. https://doi.org/10.1101/gad.9.17.2105. Waldrip, W. Ross, et al. “Smad2 signaling in extraembryonic tissues determines anterior-posterior polarity of the early mouse embryo.” Cell 92.6 (1998): 797-808. https://doi.org/10.1016/S0092-8674(00)81407-5. Christodoulou, Neophytos, et al. “Sequential formation and resolution of multiple rosettes drive embryo remodelling after implantation.” Nature cell biology 20.11 (2018): 1278. https://doi.org/10.1038/s41556-018-0211-3. Morgani, Sophie M., et al. “Micropattern differentiation of mouse pluripotent stem cells recapitulates embryo regionalized cell fate patterning.” Elife 7 (2018): e32839. https://doi.org/10.7554/eLife.32839.001. Etoc, Fred, et al. “A balance between secreted inhibitors and edge sensing controls gastruloid self-organization.” Developmental cell 39.3 (2016): 302-315. https://doi.org/10.1016/j.devcel.2016.09.016. Tewary, Mukul, et al. “A stepwise model of Reaction-Diffusion and Positional-Information governs self-organized human peri-gastrulation-like patterning.” Development (2017): dev-149658. https://doi.org/10.1242/dev.149658. Blin, Guillaume, et al. “Geometrical confinement controls the asymmetric patterning of brachyury in cultures of pluripotent cells.” Development 145.18 (2018): dev166025. https://doi.org/10.1242/dev.166025. Hiramatsu, Ryuji, et al. “External mechanical cues trigger the establishment of the anterior-posterior axis in early mouse embryos.” Developmental cell 27.2 (2013): 131-144. https://doi.org/10.1016/j.devcel.2013.09.026. Recho, Pierre, Adrien Hallou, and Edouard Hannezo. “Theory of mechano-chemical patterning in biphasic biological tissues.” arXiv preprint arXiv:1811.12242(2018). 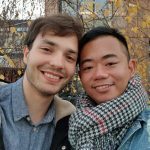 https://arxiv.org/abs/1811.12242. The reference to the paper of Etoc et al Dev Cell 2016 “asymmetric receptor localisation has been postulated to underlie patterning” needs to be corrected. As the title (“..Edge Sensing..”) and abstract make clear, our paper shows experimentally that for micropatterned hESC colonies, receptors to both BMP and Activin are only accessible to apical applied ligands at the boundaries of the colonies. This phenomena is density dependent. This is shown by visualizing the receptors and also culturing the cells on filters so their apical vs basal responses can be quantified. The discussion very explicitly remarks that the mouse embryo should operate in the same fashion since ligands released into the amniotic cavity would rapidly be accessible everywhere. This is in no way meant to detract from the very important paper from the Ramanathan lab, highlighted here.